Prior to our work, Skullduggery’s online presence was counterproductive. Their website buried their gorgeous and fun products behind poor writing and complicated site paths – all of which, combined, hid the innovation that the company had worked so hard to create. This client needed a complete makeover of their online marketing. Our team designed and developed an SEO-fueled, sleek, e-commerce website that more fully engages visitors with a better customer experience. Our team designed and developed a modern and sleek e-commerce website that, combined with extensive page optimization, now engages website visitors to stay longer on the website. 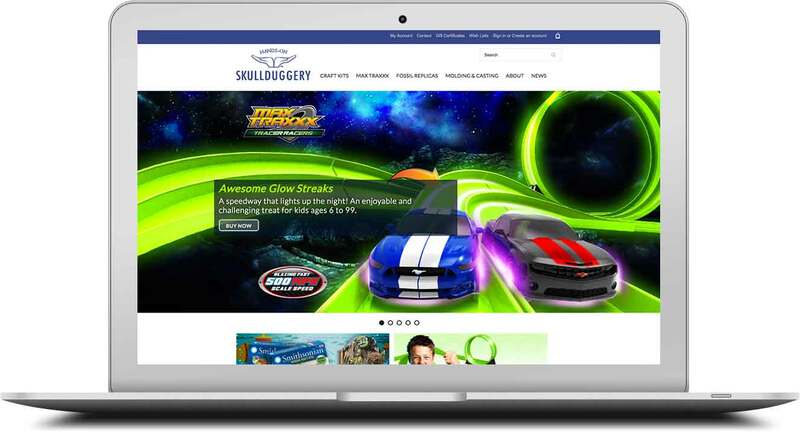 Skullduggery is a successful and innovative US-based toy manufacturer and distributor. Over the last three decades, the Southern California-based, family business has become one of the leading creator of high-end educational toys for kids in the country. Their product lines are designed to appeal to specialty toy-lovers throughout the world.